Contrary to popular belief, most people who bet on horse racing have no idea what's going on or what the best way to make money is. They generally stick to a favorite number, or color of the saddle cloth, or horse color for that matter, and hope to get lucky. If it's your lucky day, sure, you may win a few bucks, but it won't break the bank. While I understand that most people view horse racing - a sport that has been around for centuries - as leisure activity and a day to get out in the sun for good entertainment with good company, that shouldn't mean it's okay to have little to no idea of how to actually bet the races. Horse racing has its own terminology and odds system that can really throw the casual horse players for a loop. The average person may not know what a furlong is, or the where the quarter pole is or what a closer is. Hell, they may not even know how much they stand to get back if their bet does in fact win. Well, I'm here to help. The purpose of this article is to educate you on how the odds works and the potential payouts of standard bets. 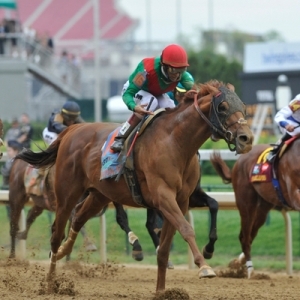 If you want to familiarize yourself with the horse racing terminology, you can click here . The "tote" board is the massive jumbotron screen that is usually located in the infield of the racetrack that displays several important notes, such as post time, minutes to post, changes, scratches, pool totals, and, most importantly, the odds. The most important part of understanding the odds is understanding that they ca decrease or increase within a matter of minutes and that you won't exactly know for sure how much you are going to win should your bet be graded as a winner. However, there are ways to educate yourself and prepare yourself for the possibly payout in order to determine if your bet is worth making or not. For starters, you must understand that the win/place/show pools are subject to a 14-20 percent take out from the track in order to pay taxes, expenses, horsemen and the track's profit. To calculate the exact odds of your horse, you must simply subtract the take from the total pool, then subtract the amount bet on your horse, which will give you the amount that is to be paid out. Then you divide that number by the amount of money bet on your horse and boom…you have odds for your horse. $465 / $300 = 1.55. This means that your horses odds are 1.55/1, which is the same as saying 3/2 - a much more common way of wording it. So now that we know how to calculate our horse's odds manually, instead of looking at the giant tote board that gives us update odds every minute, we must now figure out how much we stand to win if we bet two dollars on a horse to win at various odds. Does Horse Racing Operate with Fixed Odds? The horse racing odds system is very different from that of the sports betting industry. While 2-1 odds may pay out the same, betting a team at 2-1 will ensure you return $6 for every $2 you bet, regardless of if the line drops or increases as game time approaches. In horse racing, a horse may start out at 2-1, but if there isn't enough money being bet on him, that horse may end up going off at 6-1 or higher. The good thing is if you placed your bet early and liked the horse at 2-1, you would get the closing odds of 6-1, since the odds and payouts are based on the pool totals. The same can be said when the odds decrease. If you bet a horse that is 30-1 with around five minutes to post time, and then a slew of money comes in on that horse, you should not be shocked to see that horses odds plummet to 15-1, maybe even 10-1 depending on how much backing it receives. In this case, you'd be stuck cashing a ticket at nearly half the original value thus lowing your profits overall. Unfortunately, there isn't much you can do about that, as it's very hard to keep track of the money coming being bet on every horse in the race, especially since most major racetracks offer up off-track betting through TVG or HPI or any other horse wagering operation. So, what does this article tell us? Well for starters it gives you an idea of how much you can expect to win should you place a $2 win bet on any of the odds listed above in the chart. Second, it should help you understand that odds are made to change and that you should go with your gut in terms of who you prefer to bet on. If you like a long shot, then bet it. If you prefer the favorite, then bet it. But don't expect to get rich by doing so.